The so called "jewel of the Ionian Pelagos" and surely the most famous amongst its neighbors, also happens to be the cultural center and the most visited island in western Greece. Corfu is second to none and if you're unconvinced, a yachting charter expendition at its scenic harbors and crystal-clear waters will undoubtedly sway you to their direction. Ideal for a sailing vacation in Ionian islands - with its illustrious afternoon breezes, or a chill weekend break, this island has a wide range of offerings that you can tailor to your liking. Mountainous and with a long coastline, Corfu meets the Greek standards of landscape beauty. But the reason you'll fall in love is not the looks, but the character! Corfu is conveniently accessible, with a fair enough airport that has direct flights abroad and is only 15 minutes away from town center. Ferries are also popular, with routes to mainland Greece and Italy. This island has a history of many cultures, passing from Venetians to French and British, before uniting with Greece in 1864. Signs of those cultures are sprinkled throughout the island not only in architectural form, but in the lifestyle and even the cuisine of the locals. Among all the islands in Greece, Corfu is recognised for its rich musical tradition. Music Composers from Corfu gave Greece its national anthem, its Olympic Hymn and also its first opera. Composer N. Mantzaros was the founder of the very first modern music school in Greece. There is a full- fledged music department today at the Ionian University in Corfu and you will also come across a high school established for just the music curriculum. N. Mantzaros also set to music 'Hymn to Liberty' (The Greek Anthem), written by the poet, D. Solomos. In 1864, this was incorporated as the national anthem. Other distinguished music composers included S. Samaras wrote the Olympic Hymn. This hymn was played in Athens at the 1896 Olympic Games. It was a Corfiot that gave Greece its first opera. Influenced by the Venetians and their love for operatic music, S. Xyndas wrote the first ever Greek Opera, 'O Ypopsifios' in 1857 and it was performed in the Old Theatre in Athens. One of the unique attractions in the island of Corfu is their eighteen marching philharmonic bands. Visitors to this island should be aware that when the first of a month falls on a Sunday or any Saints’ days, then these marching bands will turn the streets colourful with their brass and fanfare and add cheer to the festivities in not only the capital, but also in its villages. The weather is warm year-round but if you're aiming for a perfect sailing adventure, opt for the late spring to early autumn period, when the winds are ideal even for novice sailors. Gouvia Marina is located about 6 kilometers away from the town of Corfu, in the east side of the island. It was the first ever marina to be privately owned in Greece, and today it's a fully organized place of high-standard facilities and services. The total capacity is 1235 berths, on both permanent and floating pontoons. If you're wondering about technical boating services, in Gouvia you'll find a full range of them. They charge an average fee of 50 euros per day, but be noticed that there are places to moor close by for €2 a day. Arguably cheaper than the Aegean islands, in Corfu you can enjoy a meal for two for about 40 euros or try a fancy cocktail for 10! The taxi service is 3 euros per kilometer, which means you should opt for a rental car if you plan to explore the hidden gems of the island. Car rental prices are about 100 euros per week. Among the things that are plentiful on this island are the beaches. Admittedly, you would need two summers to explore all of them, but don't break a sweat, we're here to point out the ones you should not miss. If sandstone cliffs and hidden caverns get you excited, head north-west to Sidari and search for the Canal d'Amour. The unique morphology of this place with leave you impressed! Then swing by the popular Paleokastritsa which you can visit by yacht and deep dive in its transparent waters. In Kassiopi you will admire the scenic coastal beauty, its Byzantine fortress and white pebble beach -attributes that make this seaside resort popular with travelers, even the hungry ones. Good food by the beach may leave you in a food coma, but luckily you'll have a great view while you recover! If you're on a sunset mission, don't forget Porto Timoni on the west side, with its unique shaped beach, and Loggas with the huge wall of cliffs. In the south of the island you'll find the pristine beaches of Kavos that go hand in hand with crazy nightlife and are suited for the young-spirited wanderers! Sailing around Corfu can be one of the most unforgettable experiences of your summer vacation. But if you're itching for something extra, this island has got you covered. From scuba diving and snorkeling services to mountain-bike expeditions, you can find activities for all shapes and sizes. Not surprisingly, water-related activities reign supreme here. Water parks are ideal for the kids, or the kid inside us, but you can even enjoy an adventurous horse riding tour among the greenest trees! 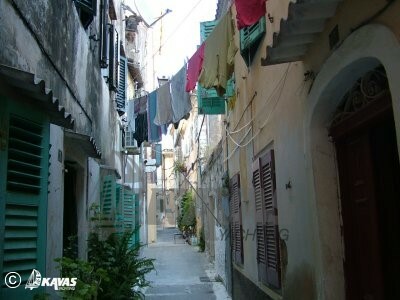 A UNESCO world heritage site, the old town of Corfu is a wonderful odd mixture of medieval fortresses, orthodox churches and small alleyways with a canopy of line-drying clothes. The several museums in town tell the story of this multicultural island, but a walk through its streets does exactly the same. Don't miss Liston, the old Fortress and the church of Saint Spyridon. One of the trademark sites of Corfu, this monastery sits on its own tiny island just a few meters off the coast. A narrow wharf is the pathway through which the visitors can access this iconic landmark. Keep an eye out for the green Pontikonisi, another tiny island, hiding behind the monastery. Built in 1890 by the Empress of Austria Elisabeth of Bavaria, a woman known for her obsession with physical beauty, this palace is one of the most famous landmarks in Corfu. Elisabeth, baffled by the island's beauty, dedicated herself to building this palace after the death of her son. She named it after the Greek hero Achilles because according to her, he represented the soul of Greece. You can find his statue on the courtyard of the building and make sure to take a tour inside its walls and see what royalty vacation palaces looked like back in the day. The Corfiot cuisine is highly influenced by its Italian and French occupants and the final result is definitely mouth-watering. Pastitsada is a traditional dish which consists of rooster with red sauce and pasta, one of the island's most delicious dishes. Try some Sofrito if you're up for garlicky veal, or Bourdeto if you'd rather fish. And what better to finish you meal with, other than a traditional Corfiot ginger beer! If you swoon over pretty yet unusual landscapes put Cape Drastis on your list. It's quiet and secluded due to the fact that it is hard to reach by land and it makes for the perfect yachting expedition. One of the great things about this remote location is that it has remained unspoiled with no signs of human intervention. The multitude of unique land formations and tiny islands will invite you to practice your cliff jumping skills. This cape is one more reason to set your sails toward the north of the island of Corfu. Just 10 miles south of the main island of Corfu, you can find the islands of Paxos and Anti-Paxos. This will be the real highlight of your sailing vacation! A place of intense beauty, those islands feature lush vegetation which contrasts the sapphire blue waters and makes for a picturesque postcard scene! Swimming off the coast of Paxos island may very well be the best swim of your life! There are four small ports on the island where you can stay overnight and add one more beautiful sunset and one more sunrise to your camera roll. For your successful sailing holidays in Corfu there is a large fleet of owned yachts available, in our Ionian isls. base in Lefkada.